SEATTLE — No one had more influence on professional sports in the Pacific Northwest than Paul Allen. But though he was the owner of the NFL's Seattle Seahawks and the NBA's Portland Trail Blazers and partial owner of Major League Soccer's Seattle Sounders, Allen usually shied away from the spotlight sought by others in his same position. As an owner, he didn't have the same visibility as the Dallas Mavericks' Mark Cuban nor was he an omnipresent figure on the sidelines like the Cowboys' Jerry Jones. Allen would leave the locker rooms before cameras arrived, shuffling down hallways and out a side door to avoid taking attention from those he believed deserved it. The 65-year-old Allen died Monday from complications of non-Hodgkin's lymphoma, according to his company, Vulcan Inc. His death leaves a big void in the sports landscape in the upper left corner of the United States, and questions are likely soon to follow about the future of the Seahawks and Blazers. He was a revered figure in Seattle for his entrepreneurship, philanthropy and for keeping the Seahawks from moving to Southern California in the mid-1990s. In Oregon, he was the billionaire who bought the Trail Blazers at age 35 and grew them into a small-market powerhouse with a pair of NBA Finals appearances while keeping them rooted in Portland. He was also part of arguably the most successful expansion franchise launch in pro sports history with the arrival of the Sounders in 2009. "He was a visionary second to none who changed the world but also changed this city which he loved," said Tod Leiweke, who was chief executive of the Seahawks in the 2000s. "He left as big an impact on Seattle as any person on any city. His legacy here in Seattle will be felt forever." Allen's passion was basketball, leading to his purchase of the Blazers in 1988. Within a few years, the team was playing in the NBA Finals with Allen regularly sitting baseline to watch his team on the floor. But it was the NFL where Allen got the most attention, first for saving his hometown team from relocation and later as the team developed into one of the league's elite franchises. Then-owner Ken Behring was set to move the Seahawks in 1996. Moving trucks had cleared out the team's facility and players did offseason workouts in Southern California until the league threatened hefty fines against Behring and lawsuits halted the attempted relocation. Allen then purchased an option to buy the franchise and he became full owner once voters approved the construction of what is now CenturyLink Field. After Allen became the owner, the Seahawks had 12 playoff appearances, three NFC titles and the only Super Bowl victory in team history. The team had made the playoffs only four times and had reached a single conference title game before him. Amid the success, Allen's most public moments came when he raised Seattle's "12 Flag" before each of the NFC title games the team hosted. "His passion for the game, combined with his quiet determination, led to a model organization on and off the field," NFL Commissioner Roger Goodell said. Allen saw the Seahawks reach the Super Bowl for the first time in the 2005 season when they lost to Pittsburgh. Eight years later, he finally raised the championship trophy after Seattle's 43-8 thumping of Denver to conclude the 2013 season, and that night he performed at the celebration party at the team's hotel. 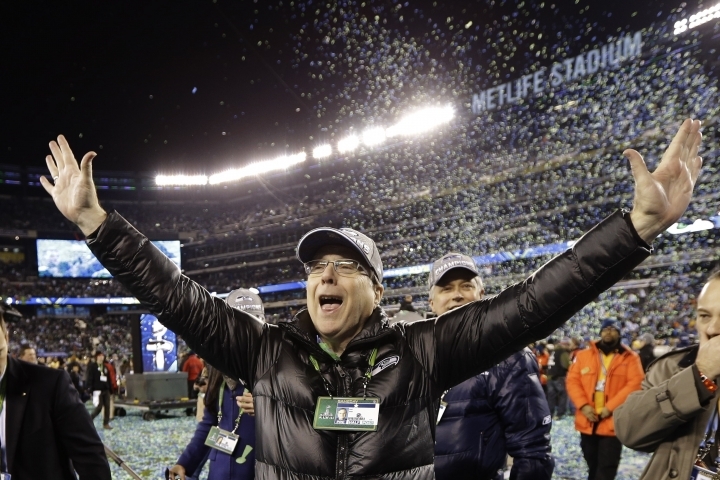 When Seattle celebrated its title in February 2014 inside CenturyLink Field, the normally reserved Allen took a moment to address the crowd. He spoke for less than four minutes, but his words carried weight for the fans. 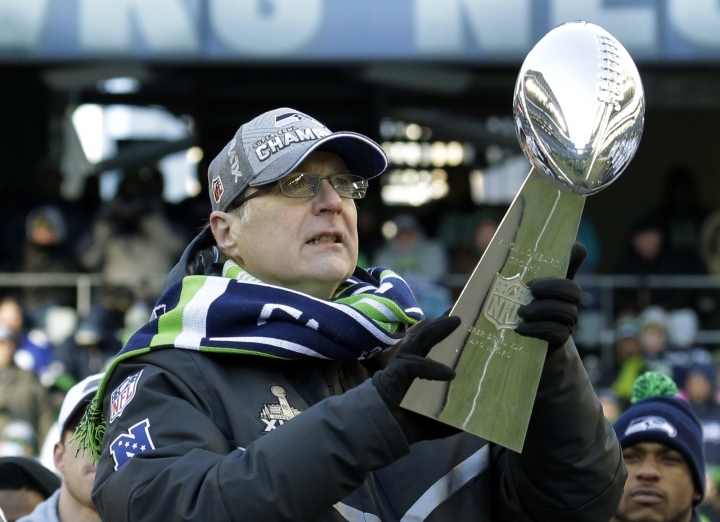 "I can't say how proud I am that the Seahawks are able to bring the Vince Lombardi trophy home to Seattle," Allen said that day. "Now we are all Super Bowl champions, each and every one of us."